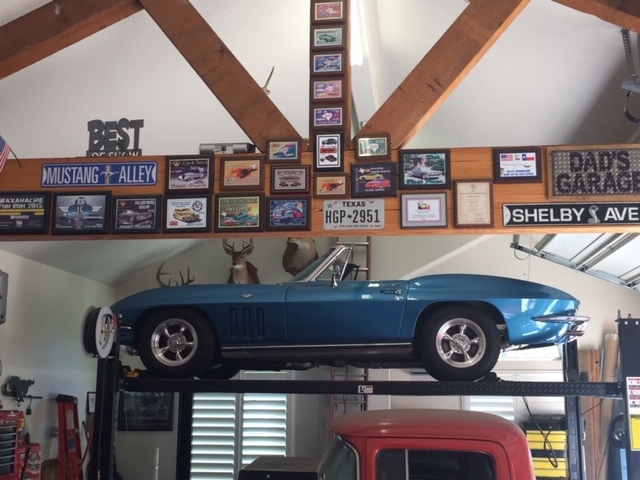 I just bought a 65 convertible 327 four speed Corvette. 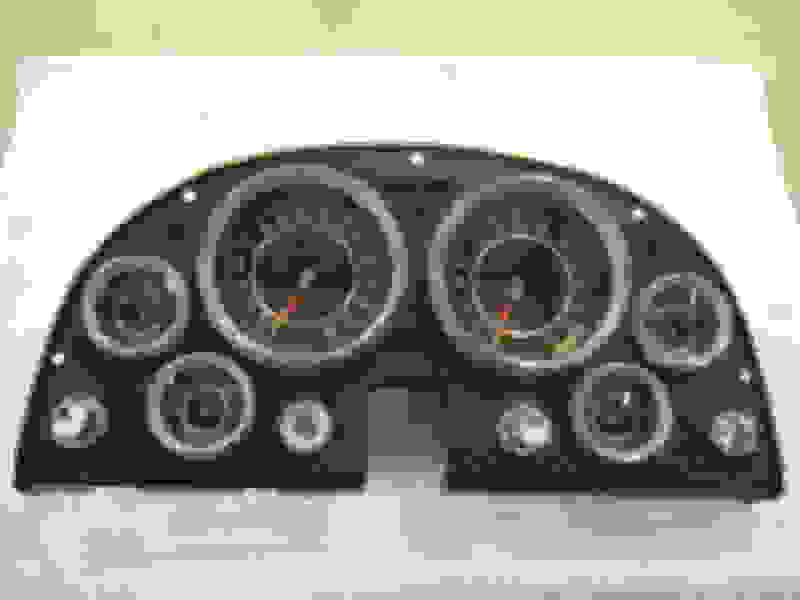 I have been looking at gauge clusters and most ads show gauges with flat faces. 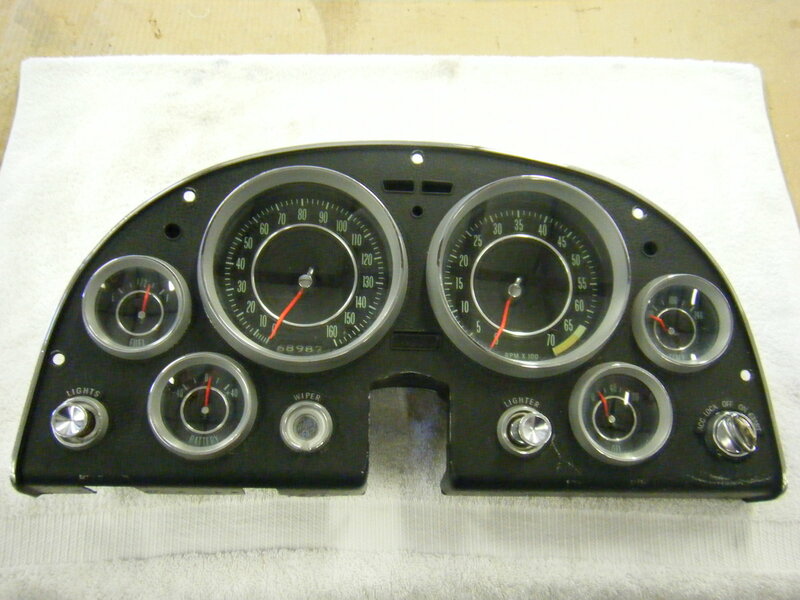 My gauges all have the recessed faces with the angled needles, like ones I have seen in a 64. Did these ever come in a 65? I am finding out the previous owner was far less than truthful when he was giving me info on the car. Not being a Vette expert, or even remotely knowledgeable, I am wondering if my "driver" Corvette was built from leftover parts! I knew it was not numbers matching when I bought it. Maybe the coat hanger wire instead of long bolts holding the gas tank straps should have been a sign of things to come. If the picture in your post is your 65, the gauges and ***** are correct. The ones in the instrument panel that is. The ones under the dash are aftermarket add ons. Last edited by 65GGvert; 04-14-2019 at 12:18 AM. Welcome to the forum and congratulation on the purchase of the '65. As was stated from the previous responses, the instrument cluster and gauges shown in the picture you posted is correct for a '65. What is the problem with the gauges that required replacements? That picture is of the instruments in the car. I was looking into changing the useless ammeter to a voltmeter, and the ones someone showed being converted were flat faced. Not really an issue, until I start tinkering with it. Those aftermarket gauges HAVE TO GO. 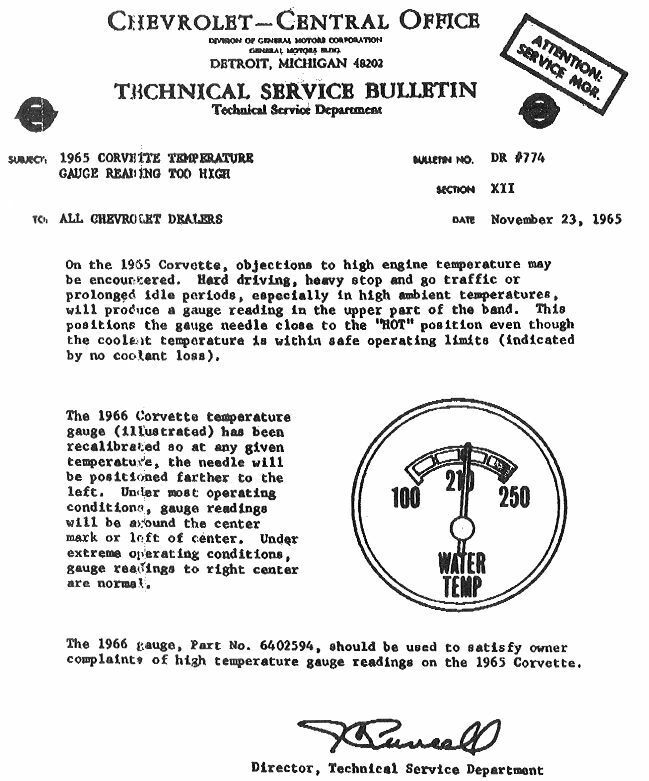 There are THREE temperature gauges on the car including the original. The engine seems to run h otter than my other old cars, around 210 on an 80 degree day. Previous owner installed DeWitt aluminum radiator, new fan clutch and some electric fans that sound like a jet plane running all the time. All of those high readings and the engine does not act like it is running hot. I will be putting in a 160 thermostat and hopefully removing the electric fans which, in my opinion, have no place on classic cars. I figure with a regular gas, low compression 305/300 crate engine and that big radiator, this car should not be overheating. And, I am not convinced it IS overheating. This is a zero option car, unless radio and heater were options. It has wrapped long tube headers and 2-1/2" chambered pipe exhaust system. Will know more when I get the tstat installed. Only thing I can see that might be wrong is there appears to be a gap in the shrouding at the bottom of the radiator. I suppose a new pressure cap and possibly fan clutch will be in order if the thermostat foes not help. Any ideas are greatly appreciated. Look in the FAQ for cooling help. John Z has a lot of info on how to troubleshoot and repair a cooling problem. I wouldn't waste a lot of money until I did the troubleshooting. A 350 cu.in. / 300 hp should run cool if properly set up. Beautiful car Steve, Sometimes the best thing you can do is undue some of the 'Improvement' from previous owners. These cars never came with a voltmeter and I don't believe there is a "matching" voltmeter available from the aftermarket - This might be a good question you could post on the forum? And on the engine temp, I agree with your ideas on the cooling (fans/shrouding) - I have a stock 300 HP with a dewitts and a 160 stat and it never runs hot. Verify the temp with an IR gun and pick a direction from there. 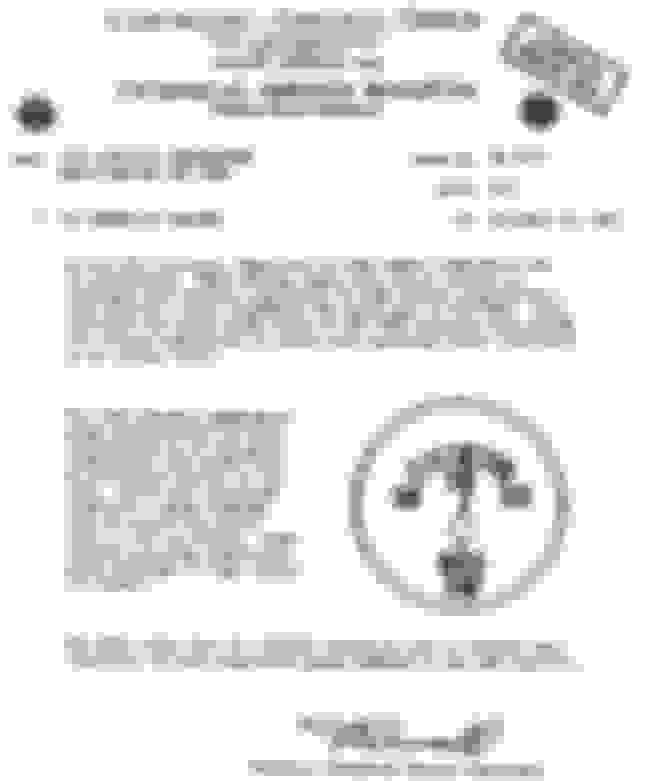 Last edited by 856666; 04-15-2019 at 05:00 AM. 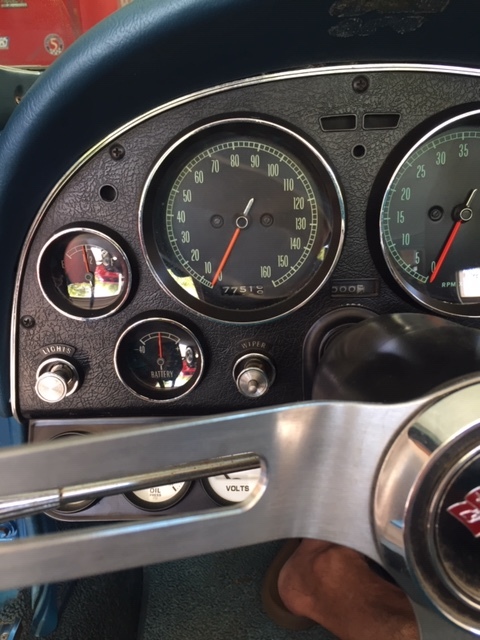 If you think an electric fan has no place on a classic C2 Corvette, then you should think twice about an aftermarket voltmeter. Before I'd go all medieval I'd step back and do some analysis. Confirm engine temps with an I/R temp gun at the thermostat housing before doing anything on that score. Last edited by Frankie the Fink; 04-15-2019 at 06:41 AM. If it weren't for the properly functioning factory ammeter in my '65, I wouldn't have noticed that the alternator had stopped putting out a charge and might have been stranded with a dead battery. I was not to mean that ALL ammeters are worthless, but the one in my 65 sure is, because it never moves. The aftermarket ammeter the Previous Owner installed under the dash does work, but I still cannot tell how much or to what level any charging is going on. I did find that ZIP Corvertte now offers a true VOLTMETER that will replace the ammeter in a 65 dash. It looks identical, except shows voltage. With that, I can tell if the alternator is doing its job. If the voltage gets lower, the alternator is not putting out enough. I have built over 40 cars through the years, (just none of them a Corvette) and have come to appreciate a voltmeter is much more informative than an Ammeter. So, I will be installing one of them in my dash. The second part of my post relates to the gauges themselves. It turns out my car has 65 gauges for the GAS and AMP gauge, but 64 model gauges for the Oil Pressure and Temperature gauges. ZIP also shows a brand new version of the TEMP gage that does not need the resistor pack, apparently running on 12 volts like other aftermarket gauges. That seems like a good possibility. Anyone tried one? I installed a new TEMP sender that supposedly has the correct ohms so the original gauge reads correctly. I started the car up and let it warm up in my shop, and the TEMP gauge went up to 180 and sat right there! I was overjoyed. Then, just because I saw it in a movie one time, I tapped on the gauge's glass lens and, sure enough, the gauge immediately shot up to 210. Next, I will replace the thermostat with a 160, just because I do not know what is in there, or if it is installed backwards or something, as Previous Owners sometimes do. My phrase for that kind of workmanship (like having three temperature gauges in one car) is Previous Owner Syndrome. The acronym of that is sometimes correctly applied to the end result of those previous owners' efforts. POS. Also, I pulled the fuse out of those $500 worth of electric fans the PO installed. The TEMP gauge did not change position... And, as stated previously, there is NO INDICATION the engine is overheating, other than the gauges go to 210. Will post a follow-up once I change the thermostat. I want to thank everyone for their comments and advice. I have a lot to learn about this new beast! The battery gauge and simple three wire circuit are very easy to troubleshoot. Seldom is the gauge bad. If you're interested, post back and I'll tell you how to find the problem quickly. If you're not interested, no problem. It will tell you instantly whether the battery is charging or discharging, key off or key on and at least to some extent how large that charge or discharge is.